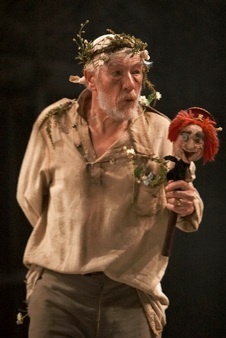 The RSC production of KING LEAR starring Ian McKellan directed by Trevor Nunn is unmissable. It is playing at the New London Theatre built in 1973 which has fairly unpleasant, poorly designed public areas, but a wonderful thrust stage in the auditorium not unlike our Festival Theatre in Stratford, Ontario, but with a larger playing area and a smaller seating capacity (only 1100 instead of 1826). “Lear” is playing in repertory with Chekhov’s “The Seagull” and both plays are given a Russian setting. The first of Nunn’s innumerable theatrical insights was to begin the play with a dumbshow representing the first court scene as Lear’s fondly imagines it. He appears in golden robes looking much like a church patriarch while the court including his daughters, also in gold, bow before him and receive his blessings. Then comes Shakespeare’s play and the reality of Lear’s world. Nunn approaches Lear’s dividing of the kingdom in a way I’ve not seen before. To emphasize that the love test is a formality, a podium is set near Lear where each of the daughters must speak to say how much they love their father. Nunn cuts Cordelia’s asides so when she comes to speak and says “Nothing”, she says it, not timidly or sullenly as often happens, but proudly and with a smile as if she expects that Lear will understand her meaning. He doesn’t because this short answer doesn’t fit what he had in mind and every attempt Cordelia (a sensitive Romola Garai) makes to explain what she thought self-explanatory only makes things worse. In Nunn’s view, Lear’s rage at her and her supporters is like the fit that suddenly comes over Leontes in “The Winter’s Tale”--not inherent senility but an inability to adjust that only time and rest, the second of which he never is allowed until the end of the play. In too many productions, directors and actors try to make Lear “mad” from the very beginning. Nunn’s view that Lear’s madness is only temporary, however, makes more sense of the text where it is repeated stated that what Lear needs most is sleep to calm his soul. And, indeed, once he is finally given that chance he does come back to his senses. The rest of the production is filled with such insights and never has the play’s action been clearer. The mystery of Goneril and Regan is whether they are evil or come to be evil. For this Nunn provides the useful metaphor of drunkenness. When we see on stage (for change) the disorder of Lear’s knights, the two sisters objections to Lear’s entourage is perfectly reasonable. From the beginning, however, Nunn shows that Regan (Monica Dolan), the duller of the two, has a fondness for drink and in virtually every scene where she appears she is swilling down more and more. Nunn’s metaphor is clearly that she also becomes “drunk” with power. Goneril (Frances Barber), in contrast, becomes “drunk” with lust. We can tell that she, though married, becomes obsessed with Edmund (Philip Winchester) the moment she sees him. When he is killed in single combat Nunn has her break down completely in mourning--the first time I have ever seen this but something that not only makes perfect sense of the story but elevates the Goneril-Edmund-Regan triangle to the level the third parallel plot about familiar love that it ought to have. Nunn also allows us to see Goneril poison Regan’s wine bottle so that we like Goneril knowing Regan’s nature wait with anticipation to see herself do herself in. Similarly, he lets us see Goneril take Edmund’s dagger so that the court’s fear she is “desperate” are more clearly founded. McKellan’s Lear, as one might imagine, is majestic. Unlike the last two Lears I’ve seen, Brian Bedford earlier this year and Christopher Plummer in 2002, McKellan does not shy away from the mad scenes but revels in them. Under Nunn’s direction what often comes out as so much gobbledygook here makes sense. McKellan’s Lear, in his dazed state, is clearly putting into words the competing feelings of guilt and outrage that are tearing him apart, to create some order from the disorder in his mind. McKellan never blusters as so many do, but brings meaning out in every line. This highly detailed by very human and unexaggerated interpretation will stay with you for a long time. Obviously, McKellan is the star that attracts people to the show, but in fact the play comes off much more as an ensemble piece than as a star vehicle because all the players and the characters they create are so strong. For instance, the function of Kent (Jonathan Hyde) as a kind of undercover guardian angel to Lear were absolutely clear. Ben Meyjes’s Edgar, who has the same function in relation to Gloucester (William Gaunt, first proud then immensely moving), beautifully conveyed his character’s frustration and pain. Too often actors forget that Edgar is feigning madness as a disguise, but Meyjes made this very clear along with the toll such a role was taking. There was fine work from Sylvester McCoy as a theatrical Fool, Jonathan Hyde as the stalwart Earl of Kent, Julian Harries as the conscience-ridden Duke of Albany and Guy Williams as the cruel Duke of Cornwall. Actors like Ben Addis (King of France), Peter Hinton (Duke of Burgundy), John Heffernan (Oswald) and Seymour Matthews (Curan) made their characters vivid. Only Philip Winchester’s Edmund did not quite rise to the level of the others, being rather more dandy and lady’s man than an incarnation of evil. 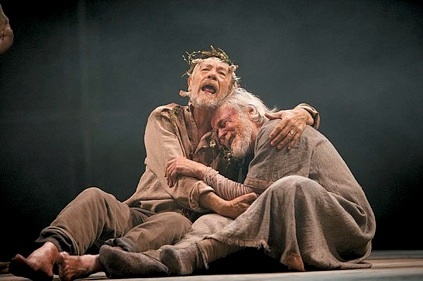 Despite this, this production goes to the top of my list for the best “King Lear” I have ever seen with a Lear in Ian McKellan that rivals William Hutt’s best-ever performance in the role at Canada’s Stratford Festival in 1988. 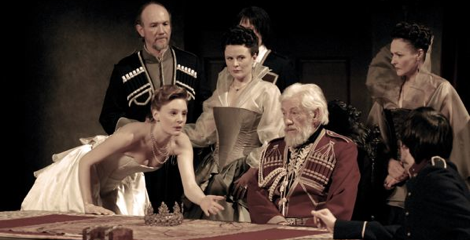 Photo: (top) Romola Garai, Guy Williams, Monica Dolan, Ian McKellan, Frances Barber and Julian Harries; (middle) Ian McKellan; (bottom) Ian McKellan and William Gaunt. ©2007 Tristram Kenton.